Bess Rutledge was once the greatest breeder of champion Standard Poodles in America. Now, at seventy, she has abandoned her lifelong dream of winning Best in Show at Westminster — a feat she never actually tried. She has razed her famous Umpawaug Kennels and sold off all her remaining dogs except the aging champion McCreery. She meets Benny Neusner, a 14 year-old boy who wants a dog more than anything in the world — as long as it’s not a poodle. Benny spends his days dreaming up ways to impress his neglectful mother and avoid work at the special school he attends. He just knows if he could win Westminster, the world’s greatest dog show, he would finally make his mother proud. Benny falls in love with McCreery, Bess’ has-been champion Standard Poodle, and dreams the old dog could win Westminster. Benny thinks if Bess coaches him, and he takes McCreery into the ring, the old champion will win. Bess’ estranged son David agrees, and so does Bess’ twin sister Mona. They also believe if Bess can finally make it to Westminster, it will bring their family back together again. If no one else can convince Bess to get back in the game, maybe McCreery’s last puppy, the beautiful Breaker, will tempt her. But is it too late? Can a crotchety old woman and a lonely boy who has never succeeded at anything combine their dreams, heal two families and achieve an ending at Westminster that is almost perfect? 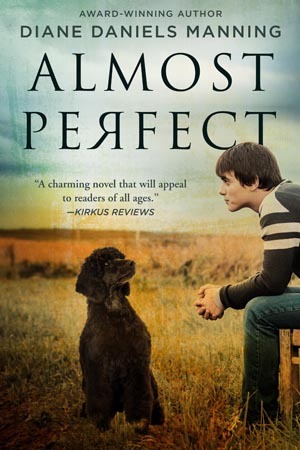 An Audible Books version of ALMOST PERFECT is now available! Click here to purchase! Up to 100% of the author’s profits will be donated to charities helping children and animals. That Could Have Been Lifted From My Novel, ALMOST PERFECT!